GuitarTone, Virtual instrument for iPhone / iPod Touch / iPad from Sonoma Wire Works. Sonoma created tonal interpretations of vintage and custom amps, pedals and microphones, and assembled them into GuitarTone. You het 3 amps and 3 effects in the free GuitarTone App. These are also in FourTrack and StudioTrack. You can get 24 more amps and 24 more effects for $9.99 per 12-pack. Add-on packs purchased in GuitarTone now are activated in FourTrack and StudioTrack on any device that uses the same iTunes account. If you connect GuitarJack you'll get 12 amps and 12 pedals free ($19.98 value). New Amp Previews: Previews are available in GuitarTone when you select "Get More Amps". You can also listen to GuitarTone previews in your desktop browser. 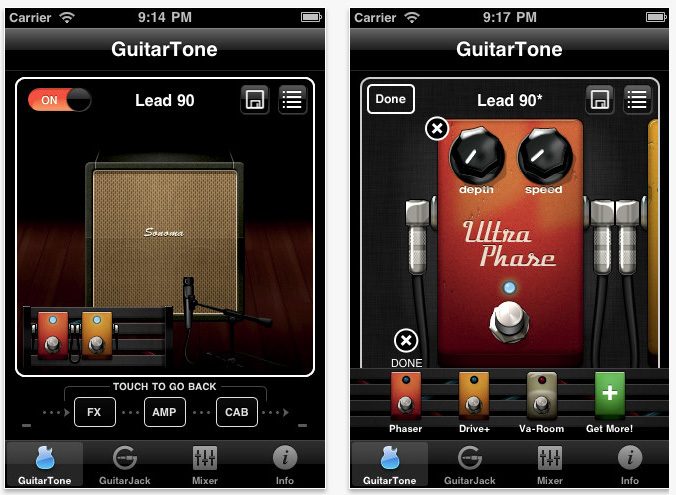 Add-on packs purchased in GuitarTone are activated in GuitarTone,FourTrack (iPhone) and StudioTrack (iPad) on any device that uses the same iTunes account. 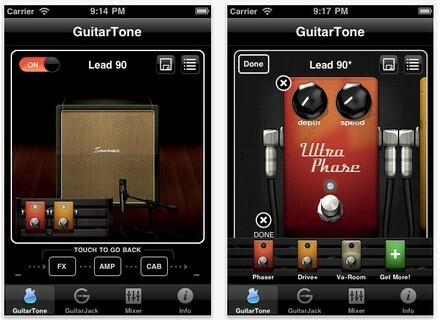 GuitarTones requires iPhone 4/4S or 4th-gen iPod Touch, with iOS 4.2 and later. An iPad version should be coming soon. Visit www.sonomawireworks.com for more details. [Musikmesse] Limiter6 vladg/sound released at the Messe an alpha version of a new limiter plug-in with codename Limiter6. [Musikmesse] Fxpansion BFD2.3 FXpansion has announced BFD2.3, now fully 64-bit compatible in Windows 7 and Mac OS X 10.5.8 or later. [Musikmesse] Cakewalk PC2A Leveling Amplifier Cakewalk has announced the release of the PC2A T-Type Leveling Amplifier Module.